Deciding wanting to overcome the urge to pull out hair is always a very personal decision. You will know you´re ready when your desire for a life of freedom from this behavior becomes really intense. To inspire and help you during this process we have included a list of personal experiences from people who have asked us for support over time. Read about their experience, in their own words, about the disadvantages (CONS) and advantages (PROS) of suffering from Trichotillomania and of overcoming this. My best kept secret for which I am very ashamed and which makes me very insecure and unhappy.Makes me insecure, always wondering if people will notice it but don’t dare to say anything about it. A vicious circle of feelings of guilt and powerlessness in which you are stuck, one that takes you down further and further. I feel imprisoned as a result of this all, not free at all. The sadness and insecurity as a result of all this. Never being able to REALLY be happy or satisfied with yourself. Constantly walking around with the fear of getting caught. Exclusion of social events and not being able to relax and enjoy situations like sports, swimming, sleeping over with friends, etc. Living with a big secret for years and constantly avoiding situations in which people can find out. In the end it only makes you unhappy, depressive and insecure. The problem gets bigger over time. Bigger bald spots that are hard to cover up and the necessity of having to wear a wig in the end. A problem that has owned my life for as long as I can remember. It is rather destructive for myself. So many people staring at you and asking questions, the shame and guilt. Also the reaction of third parties who think of it as strange and show little understanding. It causes feelings of sadness, failure, disappointment, fear, gloominess / depression. The feeling of not being able to control my actions causes me to feel restless. Reactions about my hair from my surroundings make me feel very bad. I withdraw myself from certain situations and notice I become more isolated and frustrated. It’s a part of me that I am not satisfied about and for which I am ashamed, which is getting worse over time. Often feeling down because I have been messing with my hair again. It is a bad habit that absorbs a lot of time and makes me feel bad about myself. It costs a lot of energy to be constantly occupied with this. It causes me to wear a wig, with a lot of embarrassment, and for which I also have to pay each year because every 4 to 5 months I have to buy a new wig which costs 600 Euro. The fear of being touched by other people, even in intimate relationships. Being bullied by others who find out. Not being able to go to the hairdresser, like normal people. The feeling that Trichotillomania destroys your life, which influences your nervous system – the way you feel. With everything you do, having to take Trichotillomania into account, for example when there is a lot of wind. Difficulty to become engaged in new relationships for fear of getting caught. Trying so many things that don’t work (e.g. anti-depression medicines described by a general practitioner) and constantly losing hope. The fear to show yourself, being insecure about yourself. 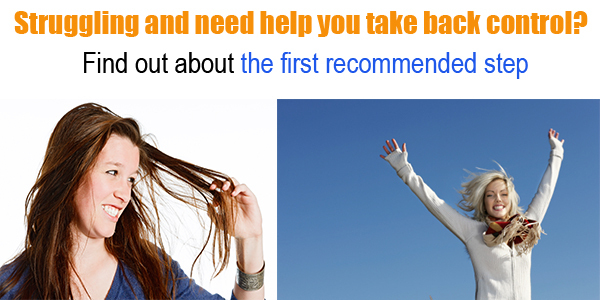 Hair that is always getting thinner on the outside, which is very uncomfortable for a woman. And on the inside constantly the feelings of shame and insecurity. Always having to come up with all kinds of excuses to prevent others from discovering it. The fact that almost no one understands this kind of behavior. Like something is wrong with you, like you are crazy. Living your life with all kinds of detours and not being really free to do what you want to do. Feeling different from other people, and at the same time realizing that it is me who is causing these bald spots. Never daring to wear your hair in a ponytail. Also on birthdays and other social events never daring to sit in the middle. Requires an enormous amount of planning and often makes is difficult to do something spontaneously if you are not prepared for it. Always something on my head to cover up the bald spots. Feeling uncomfortable when people notice that you do not have a lot of hair. The enormous amount of time and negative energy that is wasted on this bad habit. Because consciously and subconsciously this takes a lot of time. The chance of getting completely bald and maybe having to wear a wig. I just feel bald and powerless because of this. I feel wonderfully attractive again, much more aura / charisma, can love myself more, very proud, full of confidence. Healthy hair and the freedom to no longer be a slave to Trichotillomania. Finally having ended the daily battle with myself and the continuous disappointments in yourself. A heavy burden that drops from your shoulders. No longer having to live with behavior from which you are suffering and are deeply ashamed of is a real salvation. Better self-image, more confidence, better looking, happier and enjoying life a lot more. Happy, relaxed, more confidence and I feel beautiful. Wonderful to live without the shame and the chance of getting caught. Being able to wear your hair any way you want, going to the hairdresser without being ashamed and feeling free in every social situation. Going carefree through life again. No longer constantly messing with your hair. No longer having to feel frustrated knowing you pull hair and can´t stop it. Never having to think about what I can and cannot do (for example carefree swimming, water sports, walking on the beach in the wind, sitting in my convertible). A healthy head with hair and having found faith in myself again. Enjoying a lot of things more intensely (social occasions). More self-confidence, a more positive and stronger me who can deal with difficult situations much better. A beautiful head without bald spots that have to be covered up. Feeling much more at ease in most (social) situations. Wearing your hair in a different style every day without having to worry if the spots are being covered. Going to the hairdresser without feeling ashamed. Proud of myself, improved self-image, more confidence, I feel happy. I have extra time on my hands, I feel good and satisfied about myself. Less pressure on my shoulders, I feel freer and happier. Being carefree again, going to the hairdresser, walking with your hair in the wind. More confidence and happier as a result. I no longer have to think about it constantly, can now focus my attention on positive things. I feel stronger, happier, lighter. I can wear my hair loose again when going outside and feel prettier and more relaxed. I can turn my energy to nice things that give me pleasure. Am more relaxed and feel stronger. I find I can achieve more, because I no longer waste time and energy on this bad habit. Much happier in life, more satisfied about myself, feel much more relaxed. I can now simply go to the hairdresser like so many other women: I no longer have to be ashamed about myself. I feel stronger, better able to deal with stress and negative feelings. Feel freer and more like who I really am. Can go outside again without having to wear a head scarf or something like that. My partner can now go with his hands through my hair again, which is wonderful. Can do normal thinks again like diving and sports, without stress. Can now stay over with friends without being worried. Can marry and have my hair pinned up. No longer having to worry that I will pass this behavior to my children. I look normal again and no longer have stress about my hair. I am a LOT more carefree, for example with sports, buying cloths, in an amusement park on all kinds of rides, walking outside in the wind without fear. Can finally change my hairstyle and go to the hairdresser. Feel more confident, because I no longer have the feeling that I am odd – an outsider. No longer have to feel strange because of the remarks and responses of others. I notice that I can relax better now and am no longer nervous when people are standing close to me. Finally being able to have a nice facial treatment without having to be ashamed of my eyelashes. Doing nice things with other people again and no longer having to come up with an excuse or not having an answer for situations that I avoided in the past.